Parsley is a popular herb used for flavoring many dishes, and it is commonly seen on plates as a garnish. Known for its ability to neutralize bad breath, you can chew on the sprig of parsley garnishing your plate after your meal to freshen your breath. 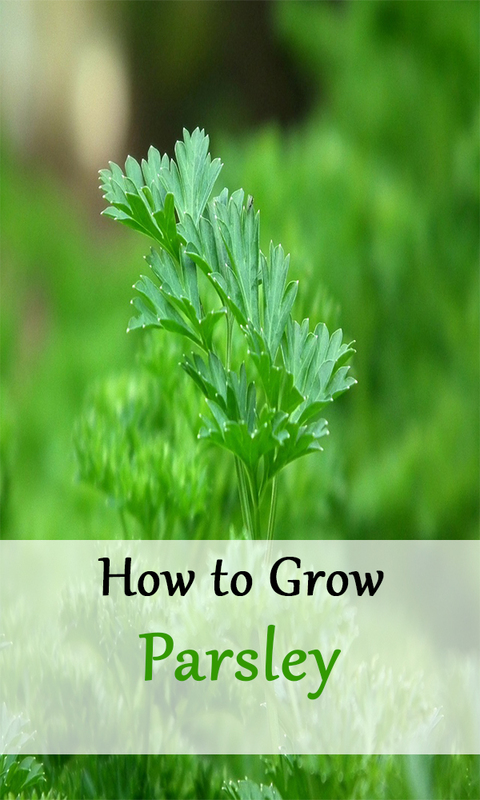 Parsley is an easy-to-grow biennial plant in mild climates, and an annual in cold climates. a mild flavor and a crinkly texture that’s great in salads. Flat-leaf parsley , also called Italian parsley, has flat serrated leaves and a flavor that is preferred by many cooks. Both types are cultivated the same way. Parsley grows best in loamy soil with good drainage and moderate soil fertility. It does best in a cool and sunny area, although it will tolerate some light shade. When planting, space your parsley seedlings 8-10 inches apart and add some slow release fertilizer to the soil as you plant. Cover the base of the plant with an inch to two inches of mulch when finished to offer some root protection and help the plant keep cool and moisturized. No worries if you are limited on planting space, as parsley can be just as easily planted in pots. To plant parsley in pots choose a pot that has plenty of drainage holes and is at least 8 inches wide. Plant one seedling per pot so it has plenty of room to grow. Even though the seedling is potted, you can still add a mulch layer to help it retain moisture and keep the roots cool. You will find that parsley seedlings are easy to care for. You just want to be sure they stay in moist soil and aren’t allowed to overheat. This is where the mulch becomes important. Mulch will help keep the roots cool and help the plant perform at its best. Parsley makes a tasty treat for caterpillars as well as white flies, so it is important to keep your eyes out for them. Caterpillars can be picked off by hand, while a food safe insecticide is recommended for ridding the plant of flies. Rot can also set in if the plant is left too damp, so avoid over watering or allowing the soil to get soggy. To enjoy a fuller plant, cut back the stems each spring. It will encourage bushy growth. Parsley should be ready to harvest in two months or less after sowing. To harvest, cut off the outer stalks close to the ground using scissors. Avoid plucking the green foliage off the tops and leaving bare stalks. For the best flavor, pick the parsley early in the day when the oils in the leaves are the strongest.